Style Note: I love trying new brands. I blogged about UK based designer, OneOne3, a few months ago. This was my first purchase and I like! The fabric is nice, they are pretty true to size, and I love the geometric design. Designs like this give this illusion of curvier frame. 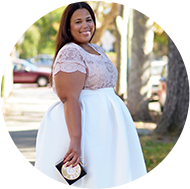 This is awesome for those who may want to achieve a curvier silhouette, but that may not be their body type. I will say that the shipping takes a little long. This dress took almost 3 weeks to get to me, so if you are ordering for an event then keep that in mind. first off i want to thank you for following me on my blog! it certainly made my day! this outfit is gorgeous. i have been eyeing that dress as well! shipping takes long from the UK in general, even living in germany it can take 1-2 weeks. Girl, you look fabulous! Very chic and your hair is just adorable! The print of that dress is perfect! Not sure if I have said this before, but your hair is gorgeous! It is! Thank you lady! LOVE LOVE LOOOOOVVVEE IT! You always INSPIRE me to try something new. As always my dear you look ama-goodness! The country version of amazing! I received my dress today!!! It is GORGEOUS!!!! !